Heh, thank you. Have you heard when or if Allie might start blogging again? Great list! I don’t read enough poetry, so I’ll be checking those poems out tonight. Thank you. I hope you enjoy them. You’re welcome. I’m so glad you liked that portion, and I think it’s wonderful that you used Langston Hughes poems as a handwriting exercise. Great TTT! Waiter Rant sounds like it’s going to be hilarious and great! Thank you. I hope you love it. Meant to comment earlier and couldn’t from the app. But I wanted to say that I LOVED Sh*t My Dad Says. Thought it was hysterical. The second book wasn’t quite as good but still made me laugh. Great list! So glad to hear that! And thank you. Sh*t My Dad Says looks really funny! I’m glad you enjoyed it. I really want to pick up Is Everyone Hanging Out Without Me? 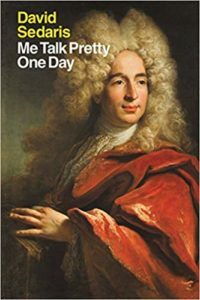 I hear it’s really funny and although I don’t pick up a lot of nonfiction novels, I think I’d enjoy this one because of the humor. I became curious about the Ursula LeGuin poem which says it was published last year since she died last year in January 2018. She must have been writing up to the very end. That makes the poem all the more poignant. Thanks for visiting my blog and sharing. You’re quite welcome. Yes, I do think she kept writing up until the very end. One more thing…The Curious Incident of the Dog in the Night-time has been made into a play. I’ve seen it and it was very creative. Yay! That’s awesome. I’m going to try to see it someday. I think you’d love it. Great choices. I love Mindi, I read her second book nut I need to get this one now. Thank you. I didn’t know she’d written a second book. Interesting. Oh, I hadn’t thought of poetry! That makes a great rainy day read, though it’s been so long since I’ve picked up a new poetry book. I do, however, have the Complete Works of Langston Hughes, so really, what else is there? 😉 Love his work, also! Sh*t My Dad Says is still one of my favorite ever books. I laughed so hard, I never thought I would stop. Did you know there’s a sequel, More Sh*t My Dad Says? I haven’t been able to get my hands on it yet, but I’m dying to read it. Love your list! Thank you. The Complete Works of Langston Hughes is wonderful! 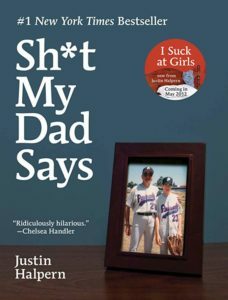 I didn’t know there was a sequel to Sh*t My Dad Says, but now I want to read it. How neat. I loved your poem recommendations! Poetry seems to be a common favorite for rainy days! 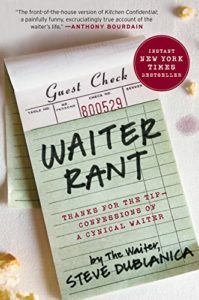 Waiter Rant sounds like an interesting book. It’s funny how people assume you’re uneducated or poor or whatever just because you’re working in a service-oriented job. Once I was talking to a customer about self-driving cars and she mentioned how “people like us” would never be able to afford a nice car. ??? After I mentioned that my husband was a lawyer, she shut up about that. I think you’d really like it. And, yes, that’s a very common assumption. I loved your story about setting that woman straight. Ah I love poetry on rainy days! I need to read Waiter Rant! I’ve never heard of it before now, but it honestly sounds like the funniest book that I have to read. I hope you enjoy it. I sure thought it was great. Great TTT topic. I should read the Mindy Khalig book. I think she is hilarious. Happy reading! I sure thought it was worthwhile. Love Sh*t My Dad says. Funniest rainy day read. I adored Mindy’s book! It would make an excellent rainy day read. I’m glad you agree there. OOh nice twist on the topic! 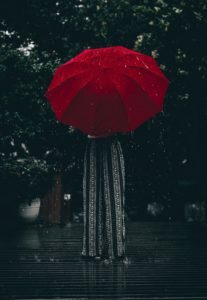 Seeing a lot of creepy style reads or the light and fluffy read for a rainy day! I think that LeGuin poem sounds fabulous too, I like how the world feels after a good rain! Thank you! Yeah, both of those books are great reads. Waiter Rant sounds so interesting! I had picked all really light and heartwarming reads, but I think a funny book would do the trick for me too. I love the sound of rain and the smell, but I feel the need to combat the dark and gloom it brings. That makes a great deal of sense. I think light and heartwarming books are a great thing to read on gloomy days. I waitressed too long to wish to return to that head space, but I remember enjoying Waiter Rant back in the day. However, I’ll seek out these poems to read soon, thanks for linking. In fact, the weekend forecast looks to be a washout. Heh, thank you. And I totally understand about not wanting to return to that headspace. I hope you love the poems. Poems on a rainy day do seem nice. The only book I’ve read from your list is Hyperbole and a Half, but you have quite the list! 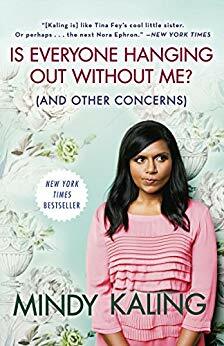 I have always wanted to read Mindy’s book. I adore her so much. You should definitely check it out when you have the time! Hyperbole and a Half and Me Talk Pretty One Day are both so wonderful. I will always remember the French lesson! Oh, that scene was the best. Hehe. I loved what I’ve watched with Mindy, so I’m definitely interested in her book. She’s hilarious. Her book is delightful. Hope you like it. Great list. I don’t read much poetry but Langston Hughes has always been a favorite of mine. He was a very talented writer for sure. And thank you. Very interesting list, Lydia! I am not that into poetry, But I would surely check them out!! Also.. I love MINDY!! Thank you. Isn’t Mindy the best? She makes me laugh every time I read her or watch something she’s in. Thanks for doing my topic! I love that you included poetry on here! I have always really loved poetry, but I haven’t had much time to read it in the past few years. I’ll have to check out your recommendations. You’re welcome. It was a really fun topic to do! The Mindy Kaling book sounds perfect!!! Heh, I’d have to agree with you there. She has a wonderful sense of humour. I loved Hyperbole and a Half so much, I miss those comics. I hear you there. I hope the author is doing well. Hyperbole and a Half is fabulous. I’d especially recommend it if you’ve ever struggled with a problem that seemed impossible to fix. I love the way the creator found funny spins to put on her problems. It’s so good to see poetry on a list! 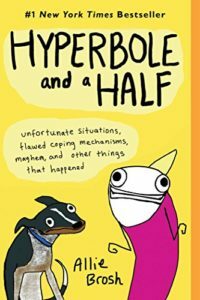 I don’t read a lot of humor books but I did read Hyperbole and a Half and it was a riot. I definitely want to pick up more from Brosh. Glad to hear it. I hope her next book comes out soon. You’ve totally just reminded me that I need to read Hyperbole and A Half. Great list! What a wonderful take on the TTT! These are titles I don’t know of, so I’m glad to learn more about them! Mindy! Thank you. Mindy is hilarious, and I hope you like her. Ooh, good question! I’ll stick to three recommendations so I don’t overwhelm you. (I can get a little over-excited about poetry sometimes. Haha). I think all three of these poems give a nice overview of the kind of short, snappy, thoughtful stuff he generally wrote. I feel like I don’t read enough funny books, so I’ll definitely have to check some of these out. Honestly, I think everyone should read a funny book at least occasionally. I hope you like my recommendations. Thank you! Yes, they’re very nice things to read on drizzly days.